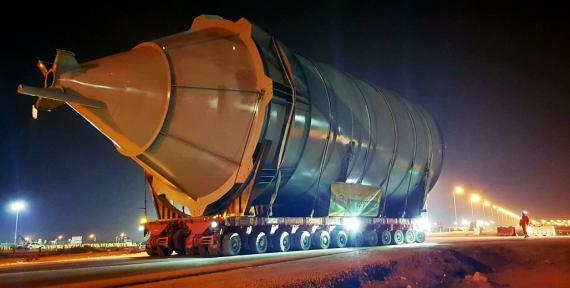 Turk Heavy Transport have found success in the recent delivery of an unusually sized cargo involving their valuable clients RAMSIS Engineering and Fives Solios & Bechtel. This delivery is part of an on-going project regarding Alba Pot Line 6 - see previous article. 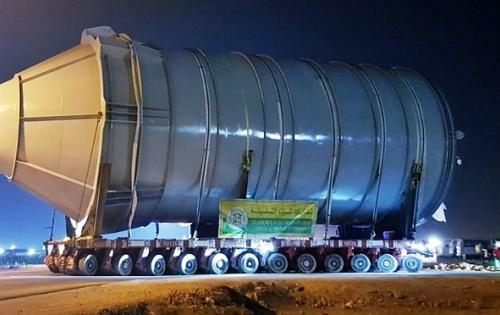 The transported cargo consisted of a large silo (23.2 x 9.2 x 9.8 m) weighing in at 65 t.
The silo was moved from a yard owned by RAMSIS Engineering to the Alba Potline 6 project site. The cargo was safely and swiftly delivered with the use of a 24-axle self-propelled modular trailer (SPMT).